"These cards evolved from separate observations of the principles underlying what we were doing. Sometimes they were recognized in retrospect (intellect catching up with intuition), sometimes they were identified as they were happening, sometimes they were formulated. They can be used as a pack (a set of possibilities being continuously reviewed in the mind) or by drawing a single card from the shuffled pack when a dilemma occurs in a working situation. In this case the card is trusted even if its appropriateness is quite unclear. They are not final, new ideas will present themselves, and other will become self-evident." Each card provides a specific directive or aphorism for the artist to follow. They range from serious to silly. Some require action, some require thought. But all of them challenge the original intention of the work, and force a re-contextualization. These are a few examples. 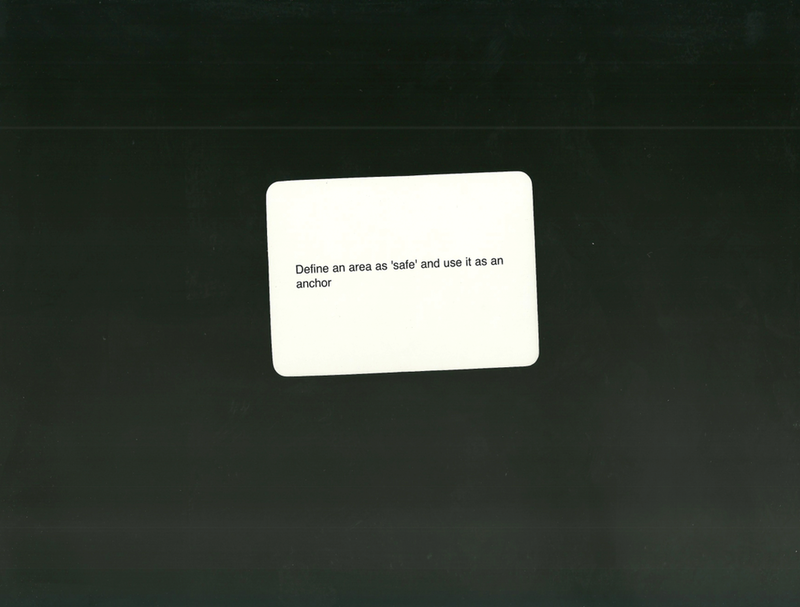 The oblique strategies work on a number of different levels. I love using them when encountering a creative block, but they are also great for voicing the need to edit. This piece created by an AP Studio Art student as an independent summer assignments. She knew something was off in the work, but wasn’t entirely sure what it was or how to fix it. Instead of just giving her an answer, I gave her a new problem. The final result kept aspects of the original but demonstrated a change in composition, while also allowing for her initial concept to come through more clearly. In Graphic Design: Portfolio Development I developed a unit based on these challenges and directives. Students were tasked with transforming a project that they had developed earlier in the semester using one of the oblique strategies. This challenge allowed students to build on ideas of typography, narrative photography, or poster design that had already been studied in previous months. Students were not to revise the original work, but to transform it into something else altogether. The designers had to include visual references to the original work within the new piece, but not replicate past work. In this first work the student was asked to remove ambiguities and convert to specifics. She selected a photograph about her nostalgia and longing to return to Ireland. 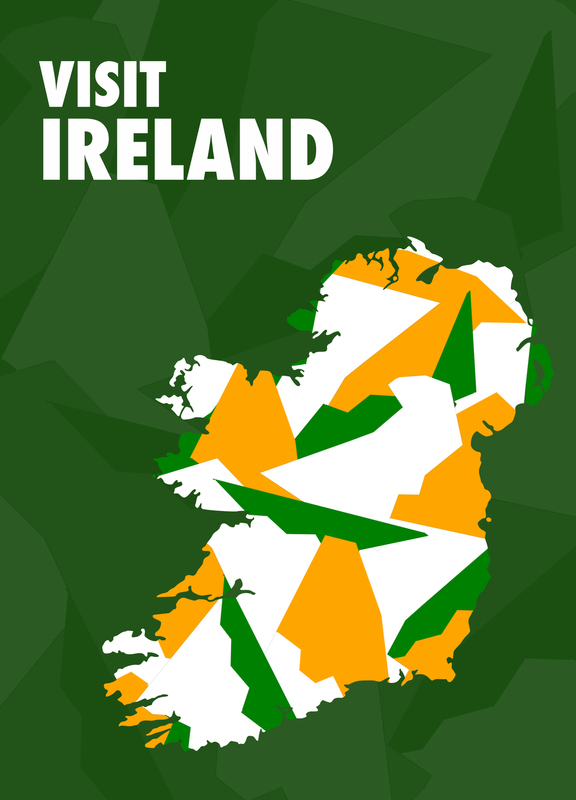 The student then developed a travel poster that used the shapes present in the original flag to fill the country of Ireland. 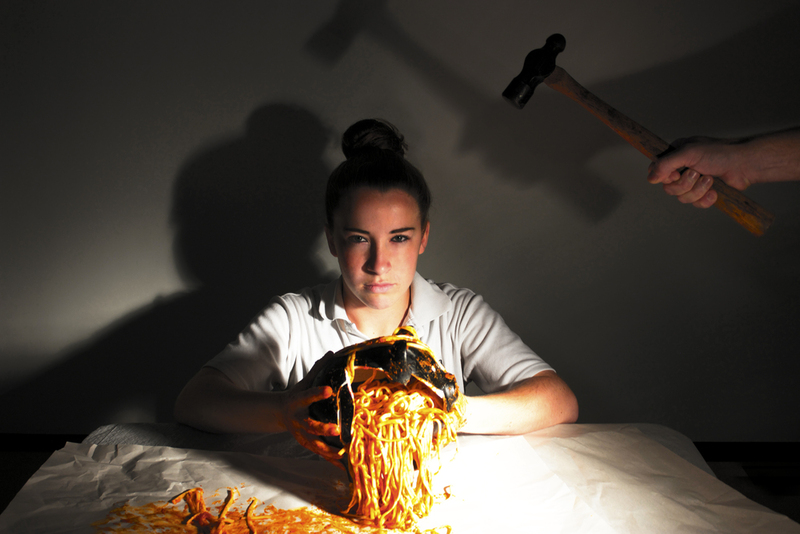 This next student spent the entire semester creating self portraits about her relationship to food. Her oblique strategy was to go to the extreme, then move back to a more comfortable place. She related her directive to the props that would be part of the next image. The designer considered her extreme disgust of powdered cheese, and decided to put herself in an extreme situation and then return to the comfortable in terms of process and media. She surrounded herself with 4 bags of Cheetos, shot the image, and then spent the rest of the day coated in Cheeto dust. This project inspires students to rethink their relationship with past work, demonstrates the need for revision, and encourages a commitment to process based thinking.